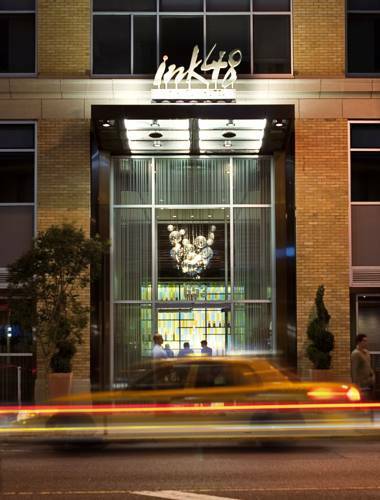 Ink48 makes an impression with much more than its stunning city views. Our boutique hotel makes a statement as distinctive as the city itself. Located where 11th Avenue meets 48th Street Ink48 is set in a former printing house. In the spirit of the occupants here who have long made their impression Ink48 inspires our guests to make their own mark in the world. Our urban retreat features open-air gardens panoramic city and Hudson River views. Just blocks to the Manhattan Cruise Ship Terminal the Pier 92-94 Convention Center the Javits Convention Center and Intrepid Air and Space Museum Ink48 makes its home near the hustle and bustle of New Yorks business shopping music and theater districts yet provides just the right respite with its location in Midtown West also known as Hells Kitchen. Our Suite and outdoor patio space offers 360 degree views of the Hudson River and Manhattan Skyline like no other! Perfect for VIP receptions and events. It's a slice of Heaven over Hell's Kitchen. Panoramic views of the Hudson River and Manhattan skyline. This terrace can host your larger VIP receptions for up to 200 guests.